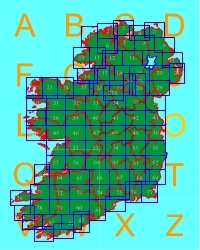 Ireland is covered by a square grid measuring 500km to a side. This is sub divided into 25 100km square areas, each one of which is given a letter. The letters used are A, B, C, D, E, F, G, H, J, K, L, M, N, O, P, Q, R, S, T, U, V, W, X, Y, Z - the letters in bold being the ones that contain land mass. Each side of these 100 km squares is further divided into 1000 units, each one representing 100m. Using these the position of a place can be given as a grid reference, which will look something like N 387 234. This first of all means that the place you are looking for is located in square N. You then use the other two numbers to locate the place you are looking for. To use the number parts of our grid reference let's take the first part, which is called the 'easting'. Across the bottom of an OS map you will see numbers that are between 00 and 99. These represent 1km i.e. 10 of our 100m units. So to locate 387 we find the vertical line numbered 38, we will come to the 7 in a moment. Then we take the 23 part of the 'northing' value (234) and find the horizontal line numbered 23 up the side of the map. Once you have these two lines find the point where they cross. This is actually the point N 380 240. Now we have to deal with the 7 and the 4. To do this you have to divide each side of the square you have just located into 10 smaller units. Then we just go across from our point of intersection 7 of these units and up 4. A useful thing to remember at this stage is that on a 1:50,000 scale map one of these smaller units measures 2mm. Ireland is covered by two complimentary sets of maps, one of which is produced by The Ornance Survey of Northern Ireland and the other by Ordnance Survey Ireland. The Northern Irish ones are called The Discover Series and the others are called The Discovery Series. The Discovery maps are 1:50,000 scale maps produced by Ordnance Survey Ireland (OSI). They are now into the 2nd Edition (some are actually in the 3rd) and one should always try to purchase the 2nd Edition versions if possible. They cover the whole of the Republic Of Ireland with a very small overlap into Northern Ireland by the border. Places of interest are very clearly marked and nearly all megalithic and early Christian Sites feature. They are very easy to read, use a nice colour scheme and the detail is very good and up to date (the only exception being some of the more recent road developments). The Discovery Series maps are each named after the counties they include. The Discoverer maps are 1:50,000 scale maps produced by The Ornance Survey of Northern Ireland. They, too, are now into the 2nd Edition and one should always try to purchase the 2nd Edition versions if possible. The old ones are red, the new ones dark blue. They cover the whole of Northern Ireland with a very small overlap into the south by the border. Places of interest are very clearly marked and nearly all megalithic and early Christian Sites feature. I have a couple of problems with these maps, firstly the gaudy colours used to represent different heights of land and secondly the county borders are really hard to see and follow, being easily confused with the regional council borders. The Discoverer Series maps are each named after an important town or geographical feature within the area covered.